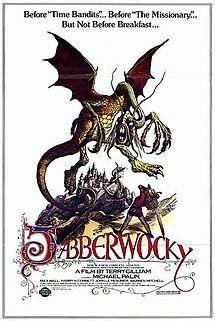 Jabberwocky is a 1977 British fantasy film co-written and directed by Terry Gilliam. It stars Michael Palin as a young cooper who is forced through clumsy, often slapstick misfortunes to hunt a terrible dragon after the death of his father. The film's title is taken from the nonsense poem "Jabberwocky" from Lewis Carroll's Through the Looking-Glass (1871). The film, Gilliam's first as a solo director, received a mixed response from critics and audiences. It has become a cult film. Despite its unpopularity, Jabberwocky established Gilliam's visual style and dark humour.